This is what I made for dinner last night. It is seriously easy (takes about 25 minutes including prep) and a healthy dinner the whole family can enjoy. You can puree this for babies between 6-10 months, and can cut it up into bite size pieces for little one's 10+ months. Chop zucchini, and mushrooms and set aside. Cut fully cooked sausage up into bite size pieces and set aside. Bring a medium size pot of water to boil. Add pasta and cook until al dente. While pasta is cooking pour jar of sauce into a medium pot and heat over medium to high heat. Add zucchini, mushrooms, and sausage to the sauce. Cover and let simmer for 5-8 minutes. Stirring occasionally. Drain pasta and put in bowls. 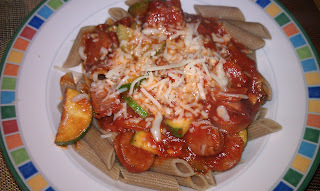 Ladle sauce mixture over pasta and sprinkle with Italian cheese and serve. If serving to Baby, puree and then serve, or cut into bite size pieces and serve. Enjoy!